To Cite: Ala A, Ebrahimi Bakhtavar H, Shams Vahdati S, Rahmani F, Azargoun M, et al. 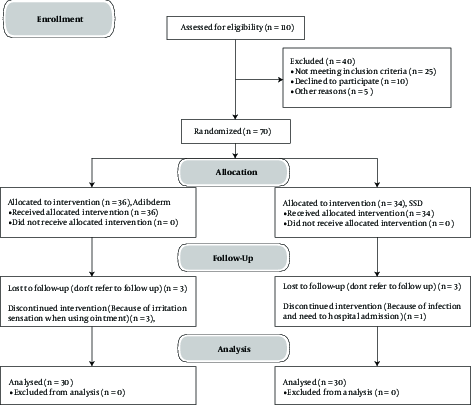 Effects of Silver Sulfadiazine and Adibderm® Herbal Ointments in Treatment of Patients with Second Degree Burns: A Randomized Clinical Trial, Trauma Mon. 2018 ; 23(2):e13396. doi: 10.5812/traumamon.13396. Background: Burns are one of the major public health problems worldwide, particularly in the developing countries. The proper treatment of burns can reduce the complications of the injury. Objectives: The current study assessed the effects of silver sulfadiazine (SSD) and Adibderm® herbal ointments to treat patients with second degree burns. Methods: In the current randomized clinical trial, 60 adult patients (ranged 18 - 65 years old) with second-degree burns and 1% - 10% burns in the extremities and trunk areas referred to Tabriz Sina hospital were enrolled. Patients were divided into 2 groups (group A, SSD ointment; and group B, Adibderm® herbal ointment). The study was conducted after obtaining written informed consent from the patients. Patients were followed up daily until the end of treatment. Healing time (days), treatment satisfaction, and complications were compared between the 2 groups. Results: There was no significant difference between the 2 groups in terms of demographic variables (P value > 0.05). The mean of healing time in groups A and B were 11.83 ± 2.32 and 7.53 ± 2.28 days, respectively (P < 0.0001). The mean of treatment satisfaction in groups A and B were 7.23 ± 1.19 and 7.83 ± 1.02 days, respectively (P < 0.041). In SSD ointment group, 1 (3.3%) patient had wound infection and 7 (23.3%) patients in Adibderm® herbal ointment group had wound irritation caused by the ointment. Conclusions: Based on the current study results, Adibderm® herbal ointment was superior to SSD ointment in terms of healing time and treatment satisfaction. Burn injuries are the most serious types of trauma that cause disability, morbidity and mortality; in addition, the imposed medical and psychological expenditures caused by burn injuries are very high (1). Burn injuries are the third cause of accidental deaths in all age groups, and the second leading cause of injury in people aged up to 4 years (2). According to a study, approximately 724,000cases of burns occur annually in Iran, of which 335,000 improve with self-treatment; about 348,000 patients visit the health centers and receive outpatient services; 38,200 people are admitted to hospitals, and about 2920 people die annually as the result of burns (3). Today, with advances in critical care, primary surgical interventions, systemic or local antibiotic prescription, and wound care improvement, the number of survived patients has increased (4). However, despite all these advances, many people still have burn accidents and die after such accidents each year (2). Despite numerous topical treatments used to treat burn wounds, sepsis is still an important risk factor of mortality in such patients (5, 6). The use of topical antibacterial drugs and rapid removal of burned tissue significantly reduce invasive infections (7, 8). Wise and appropriate use of antibiotics lead to less resistance in bacteria and more efficiency of such drugs and reduction of sepsis risk (9). Based on the burn severity classification, in second degree burning injuries, epidermis is fully destroyed, while dermis is fully or partially destroyed. Superficial burns are associated with redness of the skin, moisture and liquid leakage, blistering and severe pain, and tenderness when touched (10). Currently, a variety of ointments are used to cover the burn area based on indications in patients. Silver sulfadiazine (SSD) is one of the most commonly used topical ointments based on silver (11). But, evidence about ointments containing silver and their effects on healing wound or preventing wound infection is inadequate (12). Adibderm® is a newly produced herbal ointment. It contains the active ingredients of multiple plants including nigrum and rose extracts, ascorbic acid, wax, oleic acid (37% - 49%) and linoleic acid (37% - 47%) (13). Nasiri et al., suggested Arnebia euchroma (AE) ointment in their study due to its efficiency and low side effects to treat second degree burns (14). In an animal model study on 40 mice, Akhoundinasab et al., described Robasin ointment as an effective agent to treat burns (15). Currently, due to the importance of treatment and choosing the appropriate medication in patients with burn injury to prevent infection and for rapid recovery of the patients, many studies are conducted to compare the efficacy of topical drugs on burns. Such studies evaluated the impact of drugs on recovery time and the cost. The current study aimed at comparing the effect of Adibderm® herbal ointment with that of SSD topical ointment on the treatment of the second degree burns in patients referred to the emergency department of Sina hospital in Tabriz, Iran. The current randomized clinical trial was conducted in the emergency department of Sina teaching Hospital in Tabriz for 9 months from April to December 2016. Sina teaching Hospital is affiliated to Tabriz University of Medical Sciences, and is the burn referral center in East Azerbaijan province and even in some cases, the neighboring provinces (16). To determine the sample size and the basic information about the duration of wound healing followed by the use of SSD ointment mentioned in the study by Heidari (10) (5.9 ± 2.2 days), and considering a 95% confidence intervals (95% CI), α = 0.05, and power of 80% of a single-sequence test, and using the G power software, the minimum sample size was calculated as 20 for each group including 30% clinical significance margin, and given that there were no study on Adibderm® ointment, the healing time of this treatment was estimated with clinical significance margin. Considering the 30% dropout rate, sample size was increased to 26 cases in each group. Finally, 60 patients were studied (30 patients in each group). The census sampling method was used in the current study. Figure 1 shows the flowchart of the study. Inclusion criteria were patients aged 18 - 65 years with second degree burns of 1% - 10% size, burning with hot liquids, foods, metal, and fire, maximum 2 hours interval between the incidence of burning and referring to the emergency department, and the absence of underlying diseases that disrupt the wound healing such as immune deficiency, anemia, malignancy, using cytotoxic drugs, and allergic skin disease. Exclusion criteria were: not attending for the follow-up treatments and lack of interest to participate in the study. The current study was approved by ethics committee of Tabriz University of Medical Sciences on 09.01.2015 (approval code: TBZMED.REC.1394.491). The study was also registered in the Iranian Registry of Clinical Trials (IRCT code: IRCT2015062912592N2). Patients were randomly selected using Random Allocation Software. The randomized block model was used to study design. Sixty patients were allocated randomly to 2 groups. Due to differences in the shape and color of ointments, blinding was not applied. After obtaining informed consent, information on demographic characteristics such as age, gender, occupation, income status, education, burns, burned aresa, the percentage of burns, and the interval between burn incidence and referring to the emergency department were recorded. Then, 1% SSD (Flamexin®, Sina Darou Pharmaceutical Company, Tehran, IR Iran) (Group A) and Adibderm® herbal ointments (Adib Eksir Pharmaceutical Company, Danakasian company, Khorramabad, IR Iran) (Group B) dressings were provided for the patients. In both groups, the wound was initially irrigated with 0.9% normal saline solution, and then, the wounds were dried in the air. In group A, using a sterile tongue blade, 3 mm of SSD ointment was applied to the wound and the dressing was closed. In group B, 1 mm of the ointment was applied to the wound with a sterile tongue blade (according to the manufacturer’s instructions). Dressing was not done in this group, and the patients were advised to apply the ointment onto the wound every 6 hours (patients were taught how to dress). Patients referred to the burn clinic every day to control and change the dressing. All dressings and treatments were controlled every day by the senior and trained assistant of emergency medicine. All dressings were done by 1 person. When the skin seemed pink and healthy, it was considered improved. Healing time, complications, and patient satisfaction were recorded. Patient satisfaction was based on the visual analog scale (VAS), scored from 0 to 10 as the lowest and highest satisfactions, respectively. Analysis strategy was based on the protocol. Patients missed during the project and follow-up period were not included in the final analysis. Figure 2 shows the healing process of patients in group B. All the obtained data were analyzed with SPSS version 17.0. Descriptive statistical methods (mean ± SD) of frequencies and percentages were used for statistical expression of the obtained data. Normal distribution of data was analyzed by the Kolmogorov-Smirnov test. Chi-square test was used to compare the qualitative data. Independent samples t test was used to compare the quantitative data. In all cases, P value < 0.05 was considered significant. In the current study, 60 patients with superficial and deep second degree burns referred to the emergency department, after the initial evaluation and treatment measures, were divided into 2 groups of patients dressed with SSD ointment (group A, n = 30) and patients dressed with Adibderm® herbal ointment (group B, n = 30). The mean age of the subjects was 33.65 ± 11.95 years. In the current study, 24 (40%) males and 36 (60%) females were included. Table 1 compares the demographic and clinical findings of the patients in the 2 groups. The mean interval between the incidence of injury and referring to the emergency department was 64.50 ± 35.29 minutes. The mean percentage of burn in patients was 2.47% ± 1.70%. In terms of the severity of the burn, 26 patients had second degree topical burn (43.3%), and 34 patients had second degree deep burn (56.7%). In terms of the anatomical area of burns, 50 patients had burns in the upper extremity (83.3%), 9 patients in lower extremity (15%), and 1 patient in multiple extremities (1.7%). Cause of burn was hot liquids in 40 patients (66.7%), hot foods in 7 patients (11.7%), fire in 9 patients (15%), and hot metals in 4 patients (6.7%). Table 2 compares the clinical history and clinical examinations in the 2 groups. The overall average of burn healing time was 9.68 ± 3.15 days (range: 3 - 16). Minimum and maximum duration of treatment were 7 and 16 days, respectively, in group A (median: 12 days) while they were 3 and 12 days, respectively, in group B (median: 7.5 days). In terms of the frequency of side effects during the treatment, 7 patients (11.7%) had wound irritation in group B and 1 patient (1.7%) had wound infection in group A. The average of patients’ satisfaction with the treatment was 7.53 ± 1.14 based on the VAS scale. Table 3 compares the treatment-related variables in the 2 groups. Multiple challenges in the treatment of patients with burn injury included creating a balance between different factors involved in wound recovery. The ultimate goals of burns treatment improvement methods are to reduce the length of stay in hospital (and reduction of the treatment cost), risk of wound infection, the time of complete recovery, and functional recovery. Several methods of treatment are introduced to achieve these goals (17). According to the similar report, sepsis is the most common leading cause of death in burn patients (6). Furthermore, new methods of treatment including the use of hyperbaric oxygen are assessed to treat thermal burns, but there is no adequate evidence regarding the positive effects of this method (18, 19). Several studies are performed to compare the treatments in patients with burns. Comparing the effect of dressing with SSD and nitrofurazone ointments on the burn wound infections in patients hospitalized in children burn units, Darvishpour et al., concluded that there was no difference between the therapeutic value of such ointments and amount of ointments use (2). Comparing the efficacy of SSD and alpha herbal ointments to treat second-degree burns, Heidari et al., found that the application of alpha ointment can be considered as an alternative to treat burn patients, and using it reduces the costs through rapid wound healing (10). Nasiri et al., compared the effect of AE and SSD ointments on burn wounds recovery in mice, and concluded that recovery had a higher rate in the 10% AE ointment group. Compared to other groups, the collagen generated at the area of wound in the 10% AE ointment group was a horizontal high-quality type (20). Examining the effect of AE ointment in a human model, Nasiri et al., concluded that AE ointment was better than SSD in terms of efficiency and low side effects to treat second degree burns (14). Akhoundinasab et al., compared 3 herbal ointments to treat burns in mice, and concluded that the least angiogenesis was observed in the Robasin group that represented the minimum amount of scar, compared with other groups. In addition, the wound recovery speed in the Robasin group was higher than those of other groups (15). There is another herbal ointment called the moist exposed burn ointment (MEBO). In similar studies, in addition to evaluation of the impact of MEBO on superficial wounds, it reduced the pain in the first few days after application (21, 22); but in another study it was described improper to treat deep burn wounds, especially when there was a risk of wound infection (23). In the current study, there was no statistical significant difference between the 2 groups in terms of demographic variables and clinical findings. Average recovery time in groups A and B was 11.83 ± 2.32 and 7.53 ± 2.28 days, respectively (P < 0.0001). This difference was statistically significant and noticeable. Although the cost of a 50-g SSD ointment tube and a 25-g Adibderm® tube are about US$ 1.5 and 2 in Iran, it is affordable as there is no need to the instruments for wound dressing in Adibderm® ointment. In addition, although there was no significant difference between the 2 groups in terms of the wound depth (P = 0.067), the frequency of patients with deeper burns in group B was more than that of group A (70% vs. 43.3%), despite this difference, recovery rate was higher in group B. At the end of treatment, the patients were questioned to score their satisfaction with the treatment based on VAS. Mean treatment satisfaction was 7.23 ± 1.19, and 7.83 ± 1.02 in groups A and B, respectively (P < 0.041). It suggested that patients were more satisfied with the treatment process in group B than group A. In terms of the side effects of treatment in the 2 groups, 1 (3.3%) patient in group A was mildly infected with surrounding erythema without purulent discharge, which did not need further action except washing and clean dressing. In group B, only 7 (23.3%) patients developed wound irritation after using ointment, but they continued the treatment. However, 3 patients stopped the treatment because of irritation due to the use of ointment, so they were excluded. Difficulty in sample collection was one of the limitations of the current study. Most patients did not accept this type of therapy due to poor knowledge or lack of knowledge about Adibderm® herbal ointment; hence, they were excluded from the study. Irritation while using Adibderm® ointment led some patients in group B to stop treatment arbitrarily and use another ointment; hence, there patents were also excluded. Based on the results obtained from the current study, Adibderm® herbal ointment had high speed in the process of wound recovery, compared to the conventional treatments of burn wounds (SSD ointment); in addition, the patients were more satisfied with this treatment. Ointment manufacturers should solve the problem of irritation in the wound area to promote the treatment satisfaction. In the 1% SSD ointment, the cost of treatment increased because it needed wound bandage, but in Adibderm® ointment, there was no need to closed dressing according to the manufacturer’s instructions. Adibderm® topical ointment is a new drug approved by the food and drug administration of the Iranian ministry of health and Medical education. The current study was conducted on patients referring to the emergency department, and it was the first human model study that examined the effects of Adibderm® herbal ointment. It is required to conduct more studies with larger sample sizes on outpatients or hospitalized patients to confirm the results of the current study. The authors are grateful to all study participants, data collectors, supervisors, and administrative staff of the Emergency department at Sina hospital, Tabriz, Iran. The current article was written based on the dataset of Hamideh Ebrahimi Bakhtavar's thesis entitled “comparison of the effects of silver sulfadiazine ointment and Adibderm® herbal ointment to treat patients with grade II dermal burns admitted to the emergency department”, registered in Tabriz University of Medical Sciences (No: 94/3-6/12;19 July, 2015). Authors’ Contribution: All authors read and approved the manuscript. Alireza Ala, Hamideh Ebrahimi Bakhtavar, Samad Shams Vahdati, and Maryam Azargoun: data collection, writing, critical revision and drafting of the manuscript. Farzad Rahmani and Haniyeh Ebrahimi Bakhtavar: study design and statistical analysis, data analysis, and data interpretation. Funding/Support: The study was financially supported by the Road Traffic Injury Research Center, Tabriz University of Medical Sciences, Tabriz, Iran. Special thanks to the Research Vice Chancellor of Tabriz University of Medical Sciences for all the material and financial support of the study. 1. Smith CE, Milner SM. The burn wheel: a guide to burn resuscitation. Emerg Med Serv. 2001;30(3):76-7. 90. [PubMed: 11258307]. 2. Darvishpour A, Lotfi M, Salehi F, Aghazadeh A, hasani AAN. Comparing dressing with silver sulfadiazine and nitrofurazone on burn wound infection among the patients admitted to the pediatric burn ward in Tabriz, 2005. J Guilan Univ Med Sci. 2006;15(60):42-9. 3. Panjeshahin MR, Lari AR, Talei A, Shamsnia J, Alaghehbandan R. Epidemiology and mortality of burns in the South West of Iran. Burns. 2001;27(3):219-26. [PubMed: 11311514]. 4. Gamelli RL. International society for burn injuries survey: infection and infectious complications in worldwide burn units. Burns. 2004;30(7):655-9. doi: 10.1016/j.burns.2004.04.004. [PubMed: 15475137]. 5. Dasari H, Kumar A, Sharma BR. Burns septicemia the leading cause of burn mortality. JPAFMAT. 2008;8(2):10-6. 6. Williams FN, Herndon DN, Hawkins HK, Lee JO, Cox RA, Kulp GA, et al. The leading causes of death after burn injury in a single pediatric burn center. Crit Care. 2009;13(6):183. doi: 10.1186/cc8170. [PubMed: 19919684]. 7. Church D, Elsayed S, Reid O, Winston B, Lindsay R. Burn wound infections. Clin Microbiol Rev. 2006;19(2):403-34. doi: 10.1128/CMR.19.2.403-434.2006. [PubMed: 16614255]. 8. DeKoning EP. Tintinallis emergency medicine, a comprehensive study guide. Thermal burning. In: Tintinalli JE, editor. 8 ed. China: The McGraw Hill Companies; 2016. p. 1398-405. 9. Erol S, Altoparlak U, Akcay MN, Celebi F, Parlak M. Changes of microbial flora and wound colonization in burned patients. Burns. 2004;30(4):357-61. doi: 10.1016/j.burns.2003.12.013. [PubMed: 15145194]. 10. Heidari M, Shahbazi S, Daryabeigi R, Hoseini A, Sheikhi RA, Heidari K. Comparison of second degree burns healing time in two methods of dressing with fundermol herbal ointment and 1% silver sulfadiazine ointment. Med J Tabriz Univ Med Sci. 2012;33(6):51-5. 11. Dai T, Huang YY, Sharma SK, Hashmi JT, Kurup DB, Hamblin MR. Topical antimicrobials for burn wound infections. Recent Pat Antiinfect Drug Discov. 2010;5(2):124-51. [PubMed: 20429870]. 12. Storm Versloot MN, Vos CG, Ubbink DT, Vermeulen H. Topical silver for preventing wound infection. Cochrane Database Syst Rev. 2010;(3):6478. doi: 10.1002/14651858.CD006478.pub2. [PubMed: 20238345]. 13. Adib Exquisit Pharmaceutical Company . Bacterial ointment dermal, Adib exquisit pharmaceutical company. Tehran: Adib Exquisit Pharmaceutical Company; 2015. Available from: http://adibeksir.com/products/adib-burning-ointment. 14. 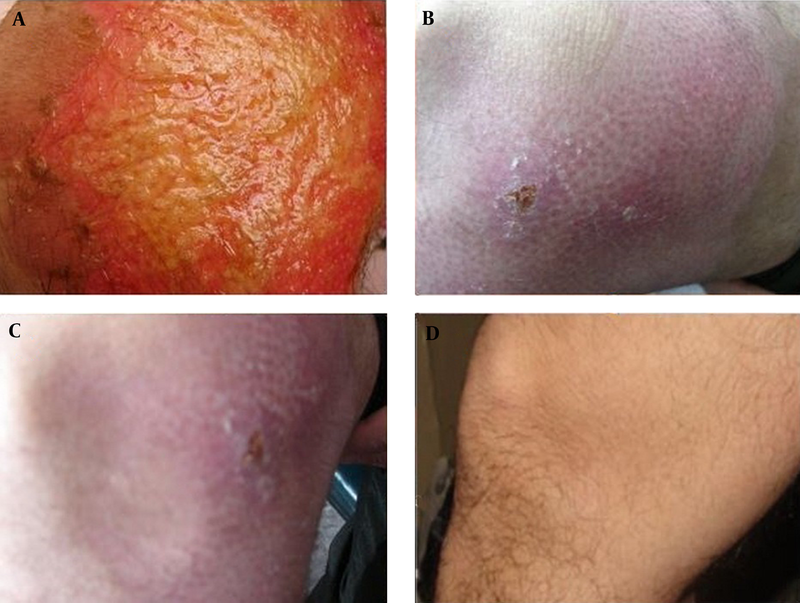 Nasiri E, Hosseinimehr SJ, Zaghi Hosseinzadeh A, Azadbakht M, Akbari J, Azadbakht M. The effects of Arnebia euchroma ointment on second-degree burn wounds: a randomized clinical trial. J Ethnopharmacol. 2016;189:107-16. doi: 10.1016/j.jep.2016.05.029. [PubMed: 27180881]. 15. Akhoondinasab MR, Khodarahmi A, Akhoondinasab M, Saberi M, Iranpour M. Assessing effect of three herbal medicines in second and third degree burns in rats and comparison with silver sulfadiazine ointment. Burns. 2015;41(1):125-31. doi: 10.1016/j.burns.2014.04.001. [PubMed: 24907191]. 16. Eshghi M, Rahmani F, Derakhti B, Robai N, Abdollahi F, Tajoddini S. Patient satisfaction in the emergency department, a case of Sina hospital in Tabriz. J Emerg Pract Trauma. 2016;2(1):16-20. doi: 10.15171/jept.2015.06. 17. Rowan MP, Cancio LC, Elster EA, Burmeister DM, Rose LF, Natesan S, et al. Burn wound healing and treatment: review and advancements. Crit Care. 2015;19:243. doi: 10.1186/s13054-015-0961-2. [PubMed: 26067660]. 18. Chong SJ, Kan EM, Song C, Soh CR, Lu J. Characterization of early thermal burns and the effects of hyperbaric oxygen treatment: a pilot study. Diving Hyperb Med. 2013;43(3):157-61. [PubMed: 24122191]. 19. Villanueva E, Bennett MH, Wasiak J, Lehm JP. Hyperbaric oxygen therapy for thermal burns. Cochrane Database Syst Rev. 2004;(3):4727. doi: 10.1002/14651858.CD004727.pub2. [PubMed: 15266540]. 20. Nasiri E, Hosseinimehr SJ, Azadbakht M, Akbari J, Enayati-Fard R, Azizi S, et al. The Healing Effect of Arnebia Euchroma Ointment versus Silver Sulfadiazine on Burn Wounds in Rat. World J Plast Surg. 2015;4(2):134-44. [PubMed: 26284182]. 21. Ang ES, Lee ST, Gan CS, See PG, Chan YH, Ng LH, et al. Evaluating the role of alternative therapy in burn wound management: randomized trial comparing moist exposed burn ointment with conventional methods in the management of patients with second-degree burns. MedGenMed. 2001;3(2):3. [PubMed: 11549952]. 22. Hirsch T, Ashkar W, Schumacher O, Steinstraesser L, Ingianni G, Cedidi CC. Moist Exposed Burn Ointment (MEBO) in partial thickness burns - a randomized, comparative open mono-center study on the efficacy of dermaheal (MEBO) ointment on thermal 2nd degree burns compared to conventional therapy. Eur J Med Res. 2008;13(11):505-10. [PubMed: 19073386]. 23. Zhang HQ, Yip TP, Hui I, Lai V, Wong A. Efficacy of moist exposed burn ointment on burns. J Burn Care Rehabil. 2005;26(3):247-51. [PubMed: 15879746].